This was the second box from Influenster that revealed the mystery brand in the first voxbox sent out that contained unbranded hair products which I received a week or so ago. 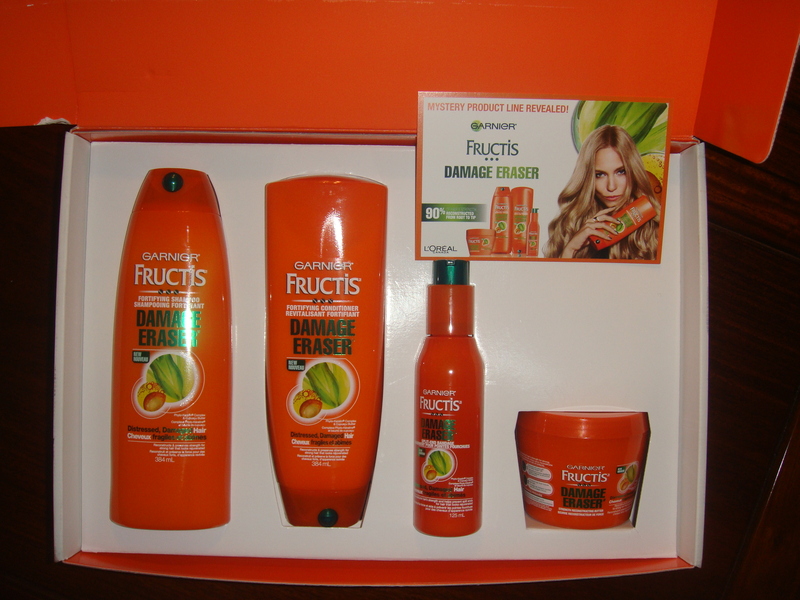 After doing a bit of research, I believed that the mystery brand was GARNIER FRUCTIS DAMAGE ERASER… and I was correct! I was quite shocked to find out that Influenster sent out full size products of this hair care line; doing so is very generous of them! I received a shampoo, a conditioner, a split ends bandage serum and a strength reconstructing butter. According to the information card, this product line contains phyto-keratin complex and cupuacu butter and this formula reconstructs hair strength by 90% from the root to the tips and prevents further damage. The benefit of this line is to nurture and strengthen the hair from using heat styling tools which can cause a lot of damage to your hair. I tried out the shampoo, conditioner and split end serum and think that they do a decent job of making the hair feel softer after use. As for the split end serum, I haven’t noticed too much of a difference in a reduction of split ends.